Very few films can boast of the kind of influence that Rome, Open City, the first chapter in Rossellini’s renowned ‘War Trilogy’, had on world cinema and various masters of the craft. This deeply humanistic film, set in war-ravaged Rome that had been declared an ‘open city’ in order to, ironically, protect its historical structures, and chronicling the struggles of the Resistance against their German occupiers, is considered as the first definitive work of Italian Neorealism, and paved the way for such luminaries as Fellini, De Sica, Visconti et al... as Godard once famously remarked, "All roads lead to Rome, Open City". The story was about efforts of the Nazis to capture Manfredi (Marcello Pagliero), an engineer and partisan leader. 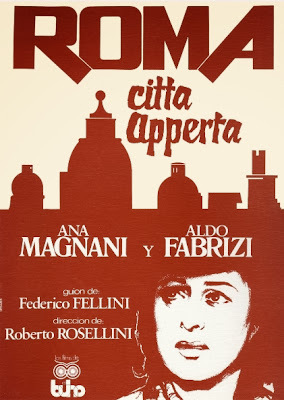 The first half dealt with his struggle to remain uncaught, through the help of Pina (Anna Magnani), a beautiful single mother slated to get married soon, and Don Pietro (Aldo Fabrizi), a portly priest who actively helps the partisan fighters. Marina (MariaMichi), a pretty and shallow young lady who caters to lascivious soldiers and is in love with Manfredi, plays the connecting thread as, out of spite, she helps the police in capturing him. The remaining portion shows the Gestapo officer’s violent but futile attempts to make Manfredi and Pietro talk. The film’s best aspect were its harrowing realism, and the sensitive and affecting portrayal of common folks – their struggle to eke out a survival during the dark times, and their few moments of happiness enmeshed by bleakness, hopelessness and heartbreaks. However, the comically hideous villain was a let-down, and it was this straightforward demarcation between “good” and “evil” that stopped this from reaching the levels of Wajda’s ‘War Trilogy’ (which too dealt with similar themes and style).